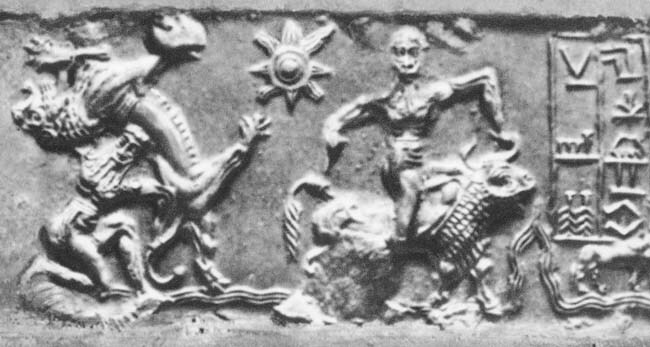 Gilgamesh and Enkidu respectively, Cylinder seal from Ur, 3rd millennium bce, height 1-1/2 inches. Most people we have found, think of Bigfoot as a modern phenomena. That is one of the most common arguments, against the existence of Bigfoot since a hominid creature is not just going to pop up recently. While the term “Bigfoot” is a modern term, the history of Bigfoot or, if you prefer, Bigfoot like creatures, extends through history and literature. The Epic of Gilgamesh is famous for being the oldest narrative in writing, it was recorded in cuneiform tablets around 2700 BCE, over 4700 years ago. It tells the story of Gilgamesh, a king of Uruk and Enkidu, who is a “wild man.” Wild Man is the usual terminology for bigfoot like creature from ancient times up past the middle ages. This is not a claim that a story about killing a giant is historically accurate down to the details, but as the main figure is accurate, it could very well be that the story of Enkidu is based on fact, even if artistic license was used liberally in the final story. Even if this amounts to nothing more than the fact that bigfoot sightings were common enough to write about a bigfoot type creature as the hero in a story. There is much more to learn, as in 2003 a German expedition was able to map the ancient city of Uruk and believes they may have found Gilgamesh’s tomb, “I don’t want to say definitely it was the grave of King Gilgamesh, but it looks very similar to that described in the epic,” said Jorg Fassbinder of the Bavarian department of Historical Monuments in Munich. (3) The research has been halted due to the political situation in Iraq, but the department of Historical Monuments in Munich is hoping to get in to continue their study. As you can see, bigfoot is not a modern phenomena, as Enkidu with all of his bigfoot like characteristics, is present in the oldest written narrative. Bigfoot is as ancient as the written word. (1)Jastrow, Morris, and Albert Tobias Clay. An Old Babylonian Version of the Gilgamesh Epic, on the Basis of Recently Discovered Texts,. Reprint ed. New Haven: Yale UP, 1920. 20. Print. (2)Mark, Joshua. “Gilgamesh.” Gilgamesh. Ancient History Encyclopedia, 13 Oct. 2010. Web. 12 Sept. 2015. (3)“Gilgamesh Tomb Believed Found.” BBC News. BBC, 29 Apr. 2003. Web. 12 Sept. 2015. By Holly in Bigfoot, Historical on September 12, 2015 . I think the literature speaks for itself about Bigfoot. We are open on Easter!